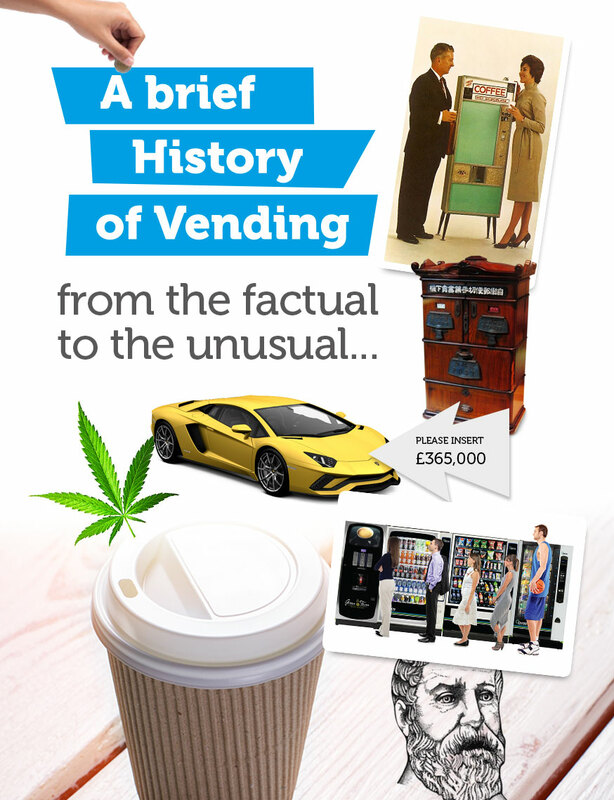 We all take the humble vending machine for granted these days, but vending has come a long way since it beginnings…. The earliest known vending machine is thought to be invented by Hero of Alexandria, a Roman Egyptian mathematician and engineer in the first-century. His Vendor cleverly dispensed holy water. When a coin was inserted into a slot in a stone table – the weight of the coin on a plate attached to a lever caused the plate to tip allowing a small amount of water to to dispense. The coin then slid off the plate which then stopped the flow of water. Although the device could easily be abused by using a stone rather than a coin, the machine would not have been misused due to fear of reprisal by their God. In Taverns around England in the year 1615, tobacco was dispensed in brass black box machines. These simple devices allowed the user to insert a penny to unlock the box, the user then filled his pipe before closing the box again – all under the watchful eye of the landlord. Vending machines that were difficult to miss-use or swindle first appeared with the introduction of postcard vending machines in England in the early 1880s. These machines soon became widespread in railway stations throughout England. The first UK company to sell confectionery through vending machines was the The Sweetmeat Automatic Delivery Company, founded in 1887 in England. A year later in the US, gum vending machines became very popular and in 1893 the German manufacturer Stollwerck sold its chocolate through 15,000 vending machines and later added cigarettes, matches and soap products to its vending line. The popularity of the vending machine rose with the expansion of the railways, with most stations around the world having some form of platform vending machine. In the 1920’s vending machines started to appear in station toilets, selling ladies toiletries. The first refrigerated soda vending machines started to appear in the 1930’s in fuel stations in the US. The bottles of pop were cooled by ice, but later, refrigerated units would boost vending machine technology, allowing 24 hour operation with The Coca Cola company championing sales. Meanwhile in Britain, the vending industry was moving quite slowly with machines not featuring beyond the railway platform with chocolate vending machines such as Nestlé and Cadbury’s. In businesses throughout the UK, the tea lady was part of every day office life and as hot drinks machines started to appear as alternatives, a backlash by trade unions meant that automatic vending would not be a regular part of work-life until the 1980’s. In the 1970’s vending machines would mysteriously appear floating in the Docks – Thrown in by angry dockers who didn’t want to lose their canteen tea ladies. By the 1980s vending technology started to move at pace with more choice and better products being offered which enabled vending companies to expand. In 1981, NVCS was born, offering complete refreshment services to businesses throughout East Anglia. Full line or banked vending machines were now able to provide a complete refreshment offering with hot drinks, snacks, fresh food and cold drinks being offered within the workplace or public buildings. 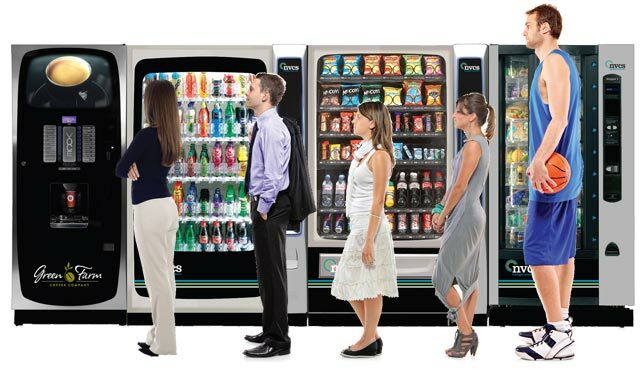 From 2000 the specialisation of vending systems became commonplace. Vending expanded into non-traditional areas like electronics, toiletries and even leisure equipment such as swimming hats and goggles. Japan leads the way in the number of vending machines with 1 vending machine for every 23 people, vending virtually anything you can think of. In November 2013, Auto retailer Carvana opened the first car vending machine in the U.S. located in Atlanta in 2013. And in 2016, Autobahn Motors, a car dealer in Singapore, opened a luxury car vending machine containing 60 cars over 15-stories, vending Lamborghini and Ferrari cars. Machines dispensing cannabis have been in use in the United States and Canada since 2010. As a controlled substance, the user has to be verified by biometric and smart vending technology. Today’s vending machines offer contactless payment, biometrics and digital technology to allow seamless, cashless vending. Some machines even allow you to make your hot drink just the way you like it via a smartphone app. Tomorrow’s vending world will look to take biometrics (facial recognition/fingerprinting) to eliminate cash altogether.